Includes poly rope mainline plus everything you need (buoy lines, spring clips for telescoping arms, all boat lane/end gate fittings etc.) EXCEPT BUOYS to build your own buoy arms and end gates using standard 50mm waste water PVC pipes. Photo illustrated instructions which only come with the course will make building the buoy arms yourself a simple task. Set up and take down instructions, detailed troubleshooting guide and more included. Anchors and buoys NOT included. Ready-to-use, one-piece EZ-Slalom mainline on an attractive, compact wind up reel. 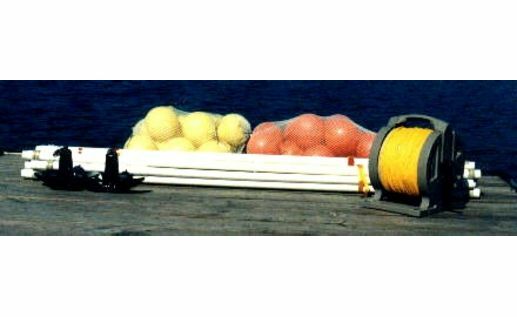 A full set of shock-corded buoy lines. A full set of spring clips (necessary to built telescoping, interlocking buoy arm sections). All fittings and parts necessary to complete the buoy arms using your PVC pipe. Complete photo and diagram illustrated buoy arm construction instructions to make building your own buoy arms using our parts and instructions and your PVC pipe a very easy and simple task. Complete materials needed and tools needed lists. Information on where to find your buoy arm pipe and what to expect to pay for it. Complete course setup and take-down instructions, a course troubleshooting guide, and lots more information.